A Coral Springs woman has claimed a $10 million lottery win — the largest haul of the year so far in Broward and Palm Beach counties. 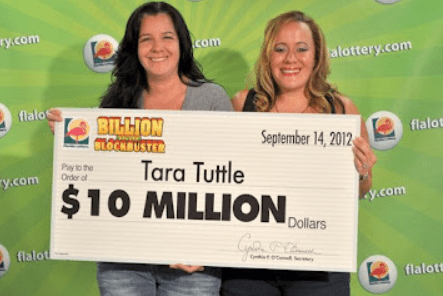 Tara Tuttle, 35, claimed the $10 million top prize in the Billion Dollar Blockbuster Scratch-off game at Florida Lottery headquarters in Tallahassee. Tuttle (pictured with her wife, Cary Tullis on the left) chose the one-time, lump-sum payment option of $6.5 million The winning ticket was purchased from Publix, located at 2201 N. University Drive in Coral Springs. If you’re looking for new casino sites, there are so many available which have excellent sign up bonuses and a wide range of games. What I appreciate about the Sun-Sentinel reporting of this is the way they just said the words without fanfare. It was just a life fact. Congratulations ladies NOW move to state that recognizes your marriage and feel free to hit the donation button located in the right sidebar.